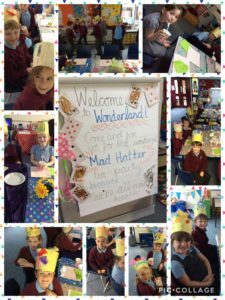 Due to their amazing work throughout this term, we ended with a Mad Hatter’s Tea Party! The children designed and created their own Mad Hatter’s top hat and took part in an excitingly bonkers afternoon! In maths Year 2 have been working extremely hard on their reasoning and arithmetic skills for our upcoming quiz! They have been investigating Numbers within 1000, ready for Year 3! We have also joined ‘Professor Pippet’ in becoming professors of Mathematics, with our measurements of capacity, weight, length and temperature…WOW! 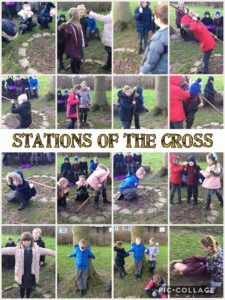 Over the Easter period, Year 2 have journeyed through Lent together, taking a closer look into Holy Week and the importance of each step of Jesus’ journey. We have also been scientists throughout this term, observing how plants grow and more importantly, what they need to do so! 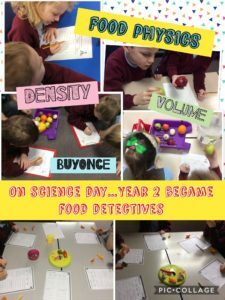 During our Science day we also investigated ‘Food Physics’ with a juicy, sink and float experiment and of course some tasting afterwards! ‘What was it like when the Queen came to the throne in 1935?’ Interestingly, Year 2 sequenced the timeline of Queen Elizabeths life, reenacted the Coronation, compared what life was like when the Queen was 7 years old and looked further into the Queen’s job. 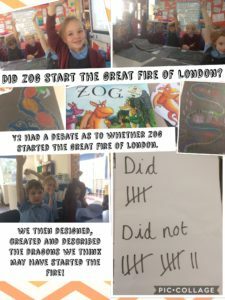 by researching the Great Fire and debating what type of character Zog is. Year 2 have used their broad range of SPaG knowledge to create amazing pieces of writing, describing the ‘Dragon Slayer’. We have also completed Non-chronological reports on a variety of animals, some of whom came to visit. How exciting! In Maths, we have been mastering addition and subtraction. Year 2 have many different strategies to answer arithmetic questions and solve word problems. What fantastic Mathematicians! Our science quest was to find out all about Living things and their habitats. We found out about the habitats of a variety of creatures in our own neighbour hood’s and also around the 7 continents of the world. 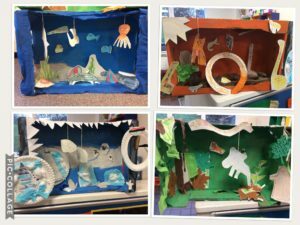 We then create a theatre backdrop for our animal hand puppets and performed a puppet show which explored where the animals live. 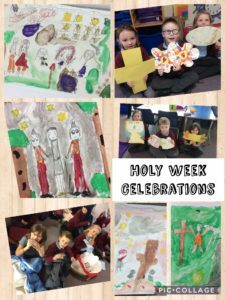 Last half term we explored the first new beginning, CREATION! We are currently discussing the topic ‘preparation’ in time for Advent. Year 2 made their own advent wreaths whilst discussing the meaning behind each candle and the surrounding wreath. 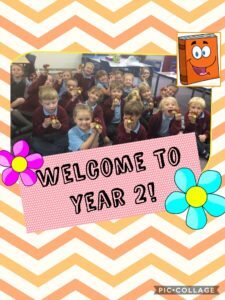 Year 2 use ‘Book Buddies’ to promote a love of reading to create a culture for reading where every child develops a thirst for knowledge and creativity through reading!